The New Year is often seen as a time to look forward – a time to plan and aim and grow. At RCH, that is definitely on the cards – we have our 50th birthday coming up in 2019 and to say we are excited would be an understatement! But at RCH Group we’re a big believer that to move forward effectively, it helps to have a realistic understanding of where you’ve come from. Our roots have always been important to us – even as an international firm with presence in over 40 countries, our heart still lies in Treviso, our beautiful hometown nestled in the corner of Northern Italy. 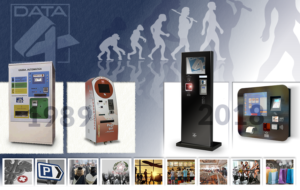 Energised about the future, we look back at our fifty years of growth with pride and a fair amount of nostalgia; after all, cash desks from 50 years ago looked just a little bit different to the ones we produce now! (Though it’s taken about 50 years for Italian fiscal law to make any changes – and that itself is going to be a big deal for us next year!). So in preparation for our big year ahead, we thought it would do us good to have a little look back at our successes from 2018; not only to learn some important lessons and identify potential areas for growth, but in all honesty to give ourselves a well-deserved pat on the back, and draw motivation from all that we’ve achieved so that we can hit the ground running in 2019. We kicked off January with the launch of our European headquarters and European Division (RCH Europe) in Innsbruck, Austria. It’s true we do have a talent for picking absolutely beautiful places from which to base our operations – popping between Innsbruck and Treviso is no great hardship! Hard to believe it was nearly a year ago now that our Overseas Sales Direct Michele Stecca was overseeing the move into the new offices. With these new offices came the opportunity to expand our cloud-based offerings; vital to securing us as leaders in the provision of smart-device based POS solutions across the European market. 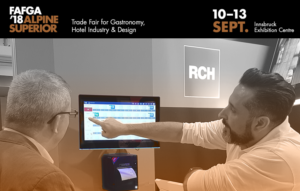 No sooner were we settled in at Innsbruck before it was time to go out and show what we could do at the INTERGASTRA show for the hotel and gastronomy industry. Smart-devices were again at the core of what we were exhibiting; intelligent software that takes full advantage of the convergence of digital and mobile technologies, using an Android system which allows for real-time remote monitoring of all transactions. Shows are also particularly great for showing off the sleek, elegant design of our hardware – particularly our portable printer which can be integrated with all kinds of third party software. 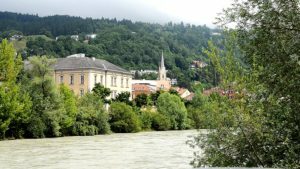 For us, it was lovely to be able to visit a show just across the border – a few hundred kilometres from Innsbruck. It was the perfect ‘Welcome to your New Home’ party for us. We love shows not only for the opportunity they grant people to really get to grips with our products, but also the opportunity they give us to meet up with colleagues and friends, old and new, and discuss where the industry is going and how we’re going to be involved in that. So at the beginning of February we were pleased to arrive at EuroCIS – leading trade fair for the retail technology sector. Our message here was about how RCH products are perfectly positioned to offer convenience, personalisation and speed of transaction – offering tools that monitor and manage all aspects of the sales cycle. Another big opening for us – and an exciting one! 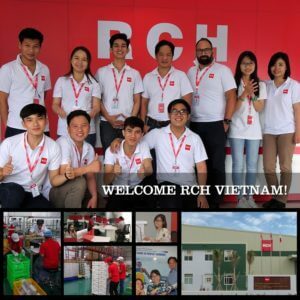 In early February we opened our new manufacturing facility in the Long An region of Vietnam. With high-tech production facilities and increased production capacity, our new manufacturing plant has been key in helping us to support the rapid expansion that we have experienced in both European and Asian markets – particularly with our longstanding offices in Hong Kong and Guangzhou. 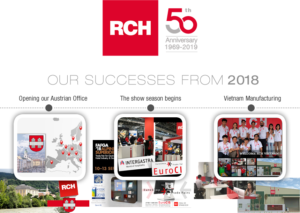 We’ve been incredibly pleased with the manufacturing facility’s operations over the course of the year; a combination of using a skilled local workforce along with Italian quality control standards has ensured our ability to maintain RCH’s reputation for exceptional quality and design. Our subsidiary Data4 were off to ISE – not only to showcase the standard range of devices and payment systems, but also to demonstrate how traditional payment kiosks can be turned into a powerful sales point through the addition of a monitor and digital signage technology. This is made possible through the K2 XL. 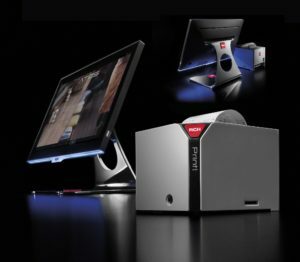 With a 43-inch monitor, digital signage and self-service payment capabilities, the K2 XL is packed with additional features that make it an industry leading, innovative method for driving sales; uninterrupted power supply, elegant but modern design with backlit LEDs, and the ability to create a personalised experience for the consumer. We were proud to be able to demonstrate the K2 XL at ISE, and excited by how well it was received. Another hospitality show for us – but this time right in our own new hometown of Innsbruck! Our key message at shows is not just to communicate how innovative our POS technological solutions are, but to communicate how this benefits real people working in the real world. The incredible pace of the hospitality industry calls for technologies that are fast, efficient and reliable – but that maintain the elegance required for immersive dining and hospitality experiences. This is embodied particularly in our ATOS 15 Elegant range, with chrome effect base and a rear customer graphic display to allow for personalised branding and promotion. With such a visually elegant product, tradeshows are really the best environment to showcase just how much benefit can be realised from the use of RCH POS products in a real-world setting. Data4 were out and representing the RCH group again; this time at Europe’s only dedicated kiosk event, the Kiosk Summit in UK. For us, this was a fantastic opportunity to see what is happening in the industry around us – and allow us to show how we remain at the top of our game. We went in guns blazing with the slim version of the K2, the ATOS 15 Elegant and our full range of innovative solutions. We had the opportunity to show how our diverse and flexible range of options can meet just about every possible user need in the POS market; we improve end-user quality of service, customise experiences, reduce customer waiting time, streamline the customer journey and drive fiscal efficiency and ease for businesses. And we do this across diverse industries, from hospitality to transport to cinemas, offering support at every stage. And that’s it – for now. A whistle stop tour through an eventful and exciting year. We’re so proud of the products we’ve brought to market, the expansions we’ve made – both in terms of manufacture and sales/distribution – and the fact that we continue to remain at the forefront of technological innovation in the industry. For 50 years we’ve been building an incredibly sturdy basis to our operations – 2018 has only further enforced this and 2019, our 50th birthday year, only stands to capitalise on it yet further. So to all our customers, collaborators, workforce and strategic partners, we’d like to wish you a very prosperous New Year – and we look forward to receiving many, many birthday presents in 2019!